Once again Maria is being sheared and weakening. This has been a cycle of strengthening and weakening for the last several days now. The hurricane center's estimate was a little too close to Puerto Rico. The low level center has become apparent the last few hours as it has moved from under the thicker cloud cover. 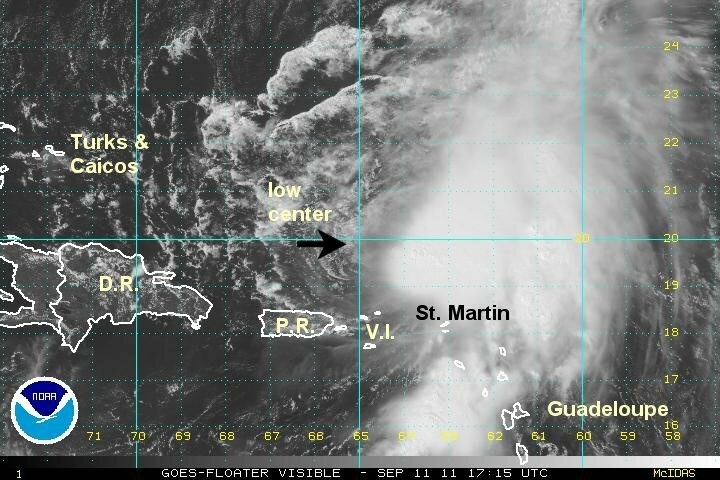 At 2 pm edt / ast Maria was centered at 19.9 N / 65.1 W or 120 miles northeast of San Juan Puerto Rico. Top sustained winds estimated at 45 mph (NHC 60 mph last advisory). Movement wnw at 13 mph. Pressure estimated at 1007 mb. Maria is moving north of the Virgin Islands and Puerto Rico today. The effects will gradually diminish into Monday. Maria will turn east of the Turks and Caicos and southern Bahamas during Monday and Tuesday. The southeastern Bahamas and Turks and Caicos will probably see some effects depending on how large and strong Maria is at that point. Maria is forecast to then move northeast possibly in the vicinity of Bermuda by around Wednesday or Thursday. Interests in the Leewards, Bahamas, and Bermuda should follow the progress of Maria. Maria is is badly sheared with convection on the eastern half of the circulation. The surface circulation also remains a bit nebulous as the hurricane hunter found a large general center with several vorticies inside it. This is not a sign of a well organized tropical cyclone. 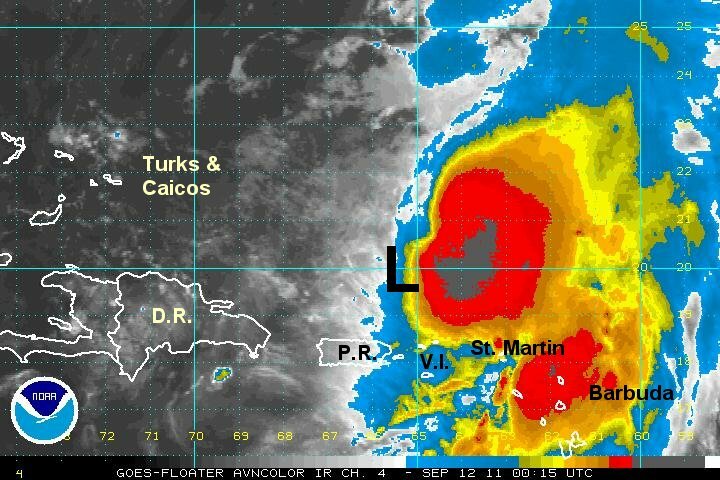 Desite this convection is very strong and no doubt producing strong winds and very heavy rains....thankfully north of the Leewards. At 9 pm edt / ast Maria was centered at 20.0 N / 65.4 W or 120 miles north of San Juan, Puerto Rico. Top sustained winds estimated at 55 mph (NHC 60 mph last advisory). Movement wnw at 9 mph. Pressure estimated at 1005 mb. The effects of Maria will gradually diminish into Monday in the Leewards. 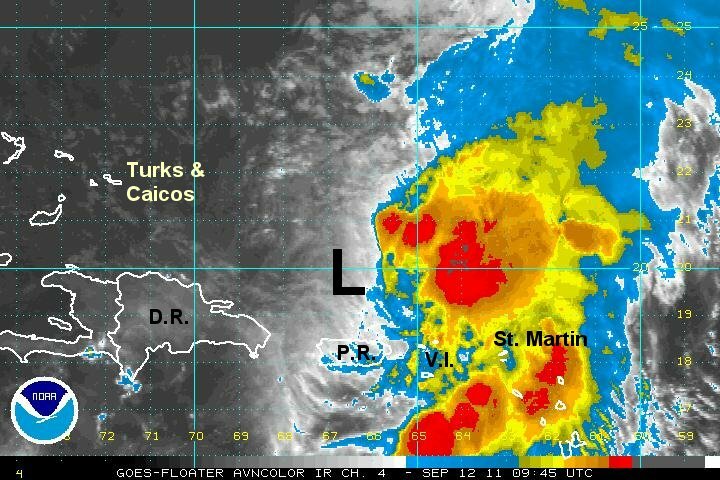 Maria will turn east of the Turks and Caicos and southern Bahamas during Monday and Tuesday. The southeastern Bahamas and Turks and Caicos will probably see some effects depending on how large and strong Maria is at that point. Maria is forecast to then move northeast possibly in the vicinity of Bermuda by around Wednesday or Thursday. Interests in the Bahamas, and Bermuda should follow the progress of Maria. Maria has changed little from last night. It is a badly sheared tropical cyclone with the low center exposed to the west. A ball of impressive convection remains to the east of the center where the strongest winds are located. The Leewards continue to report light winds with scattered thundershowers. The unsettled weather should gradually diminish in the Leewards today as Maria turns northwest and away from the Caribbean. At 7 am edt / ast Maria was centered at 20.8 N / 66.7 W or 290 miles ese of Grank Turk / 800 miles south of Bermuda. Top sustained winds estimated at 55 mph (NHC 60 mph last advisory). Movement nw at 9 mph. Pressure estimated at 1005 mb. The effects of Maria will gradually diminish today in the Leewards. Maria will turn east of the Turks and Caicos and southern Bahamas later today and Tuesday. The southeastern Bahamas and Turks and Caicos will probably see some effects depending on how large and strong Maria is at that point. Maria is forecast to then move northeast possibly in the vicinity of Bermuda by around Wednesday night or Thursday. 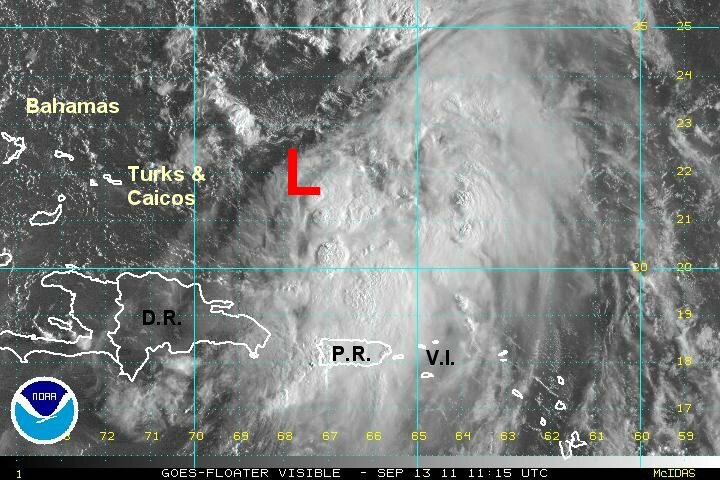 Interests in the SE Bahamas, Turks and Caicos, and Bermuda should follow the progress of Maria. Maria has stopped its forward progress today. This sometimes happens before a turn. It's also possible that the circulation is about to disintegrate. Deep convection is still barely holding on to the eastern side of the circulation. Maria has ought off windshear several times before and we'll have to wait and see if it can once again survive. The hurricane center is holding onto the storm status for sake of continuity. Maria definitely does not have sustained winds of 50 mph. 40 mph is pushing the limit. 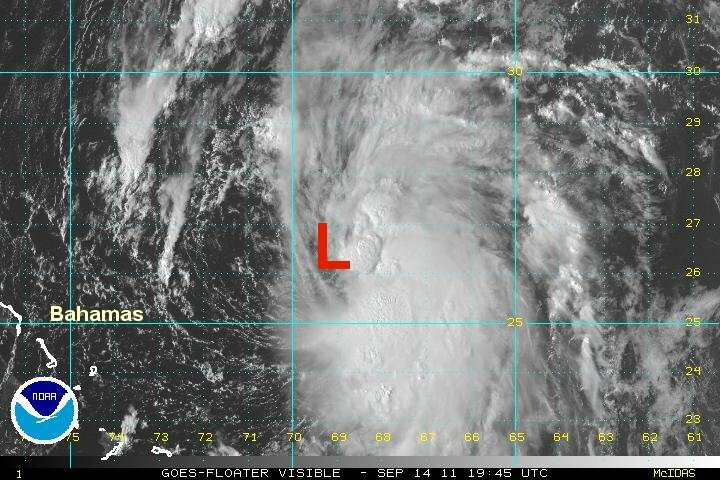 At 2 pm edt / ast Maria was centered at 20.8 N / 67.1 W or 265 miles ese of Grank Turk / 810 miles south of Bermuda. Top sustained winds estimated at 35 mph (NHC 50 mph last advisory). Movement:stationary. Pressure estimated at 1005 mb. There is still a huge mass of convection on the eastern side of Maria. The storm is still being sheared from and upper air trough just to the west. 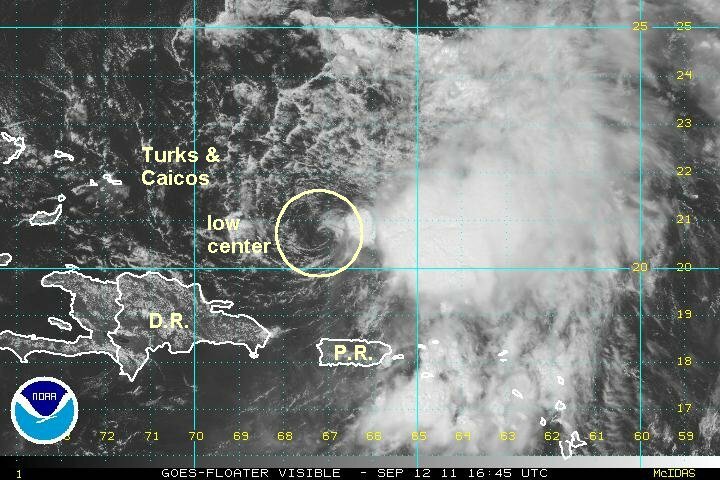 The low center does appear to be a little closer to the convection so some strengthening may be seen today. Heavy rains from Maria have parked over Puerto Rico. Doppler radar totals have estimated more than 8 inches with rain continuing. 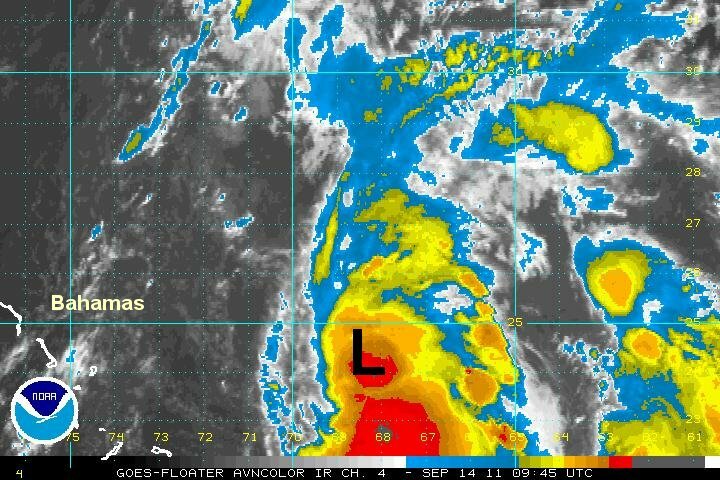 At 8 am edt / ast Maria was centered at 21.9 N / 67.9 W or 320 miles east of southeastern Bahamas / 745 miles ssw of Bermuda. Top sustained winds estimated at 45 mph (NHC 50 mph last advisory). Movement: nnw 5 mph. Pressure estimated at 1006 mb. Maria is turning east of the Turks and Caicos and southern Bahamas today. Maria is forecast to then move northeast possibly in the vicinity of Bermuda by around Wednesday night or Thursday. Satellite imagery shows that deep convection is building around the actual surface low. This is something that has not been seen in several days. A larger mass of showers and storms continues on the eastern side of the circulation. Due to the shearing effects, the Bahamas and Turks and Caicos have seen little weather from Maria. Only a few small thundershowers are near Grand Turk. 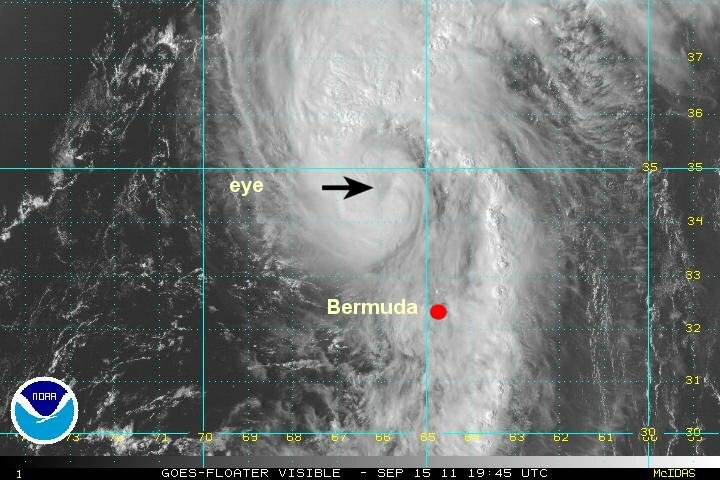 At 5 pm edt / ast Maria was centered at 22.5 N / 67.9 W or 220 miles ene of Grank Turk / 710 miles ssw of Bermuda. Top sustained winds estimated at 45 mph (NHC 50 mph last advisory). Movement: nnw 4 mph. Pressure estimated at 1005 mb. Maria is east of the Turks and Caicos and southern Bahamas today. Maria is forecast to then move north northeast in the vicinity of Bermuda by around Wednesday night or Thursday morning. Interests in Bermuda should follow the progress of Maria. After being nearly stalled for the last day and a half, Maria has resumed a quicker pace to the north northwest. The Bahamas and Turks and Caicos continue to see little effects from Maria as the deep convection remains mostly on the eastern side of the circulation. The heavy rains also have finally pulled north of Puerto Rico and the Leeward islands with only a few showers left. Bermuda will see increasing chances of rain later today and winds will slowly increase. Maria will pass west of Bermuda by roughly 100 miles Thursday morning. I am estimating Maria a little lower than the hurricane center. They based their estimate on a buoy report and satellite interpretation - the same as I did. I still don't think that there are gusts to 75-80 mph yet. That is what you should find with sustained winds of 60 mph. Seas are up to around 20 feet under the deepest convection. At 7 am edt / ast Maria was centered at 24.3 N / 68.6 W or 695 miles ssw of Bermuda. Top sustained winds estimated at 50 mph (NHC 60 mph last advisory). Movement: nnw 10 mph. Pressure estimated at 1001 mb. Maria is east of the southern Bahamas this morning. Maria is forecast to then move north west of Bermuda by late tonight / tomorrow morning. 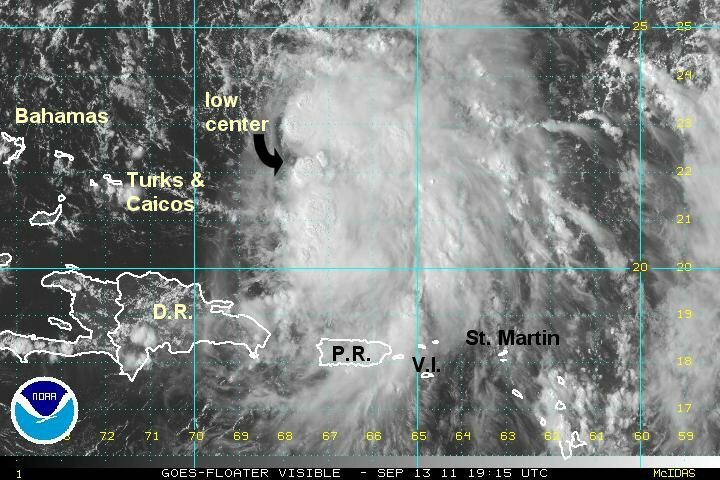 Tropical storm Maria has changed little in organization today. There is some deep convection near the center of circulation, but most remains well to the southeast of the low. I still believe that 60 mph is too strong for sustained surface winds and continue to estimate a lower wind speed. A recon plane will be in Maria shortly to give more precise data. 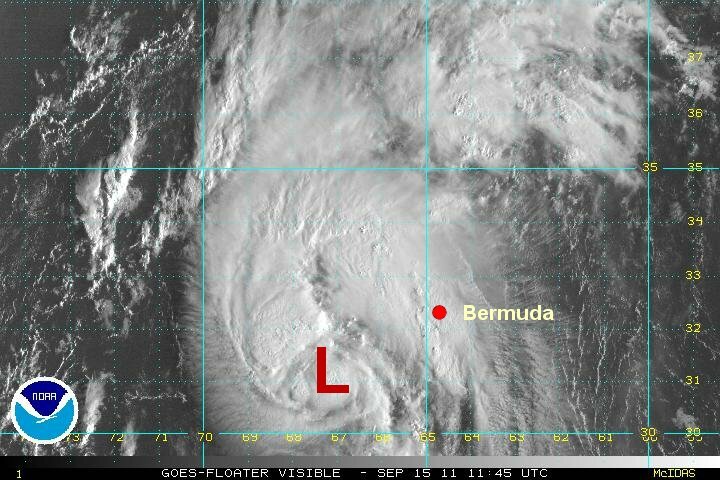 At 5 pm edt / ast Maria was centered at 26.3 N / 69.3 W or 495 miles ssw of Bermuda. Top sustained winds estimated at 50 mph (NHC 60 mph last advisory). Movement: north 15 mph. Pressure estimated at 1001 mb. Maria is east of the northern Bahamas this evening. Maria is forecast to then move north, west of Bermuda by late tomorrow morning. Maria may clip Newfoundland as it starts to recurve across the north Atlantic on late Friday. Interests in Bermuda and Newfoundland, Canada should follow the progress of Maria. Maria is accelerating to the northeast and will pass Bermuda to the west this morning. Winds will pick up to tropical storm force over the next few hours. Recent winds were in the vicinity of 30-35 mph. A large area of heavy rain is moving to the west of Bermuda, but rainbands with squalls will still pass over the island today. NOAA reports that waves are over 20 feet with Maria. Maria is moving rapidly so the seas should calm down farily quickly as the storm passes Bermuda. Maria is still fighting wind shear and will lose its tropical characteristics over the next 24 hours as it rapidly moves to the north Atlantic. Some effects may clip eastern Newfoundland tomorrow afternoon as Maria passes to the south of Canada. At 8 am edt / ast Maria was centered at 30.9 N / 67.8 W or 200 miles wsw of Bermuda. Top sustained winds estimated at 60 mph (NHC 65 mph last advisory). Movement: nne 28 mph. Pressure estimated at 999 mb. Maria is southwest of Bermuda this morning. Maria may clip Newfoundland as it starts to recurve across the north Atlantic on late Friday. We'll it looks like NHC is going to make Maria a hurricane on the next advisory. They bumped the winds up to 70 mph at 11 am edt. A recent satellite estimate placed winds at 65 mph which I think is fine. The satellite presentation of Maria has improved markedly today as clouds have cooled rapidly near the center of the low. This has allowed an eye to start taking shape. Visible satellite also shows the eye organizing. Bermuda saw some gusts to minimal tropical storm force as Maria passed by to the west. Winds will weaken rapidly tonight. Maria will be a hurricane for about 24 hours as it accelerates northeast across the northern north Atlantic ocean and transforms into a north Atlantic gale. At 5 pm edt / ast Maria was centered at 35.2 N / 65.6 W or 205 miles nnw of Bermuda / 1025 miles sw of Cape Race, newfoundland. Top sustained winds estimated at 75 mph (NHC 75 mph last advisory). Movement: nne 36 mph. Pressure estimated at 987 mb. Maria is well north of Bermuda and will pass south of eastern Canada Friday. Some effects may reach Newfoundland. Interests in Newfoundland, Canada should follow the progress of Maria. Maria is rapidly moving toward the southeastern tip of Newfoundland by this later this afternoon. It is moving as fast as any tropical cyclone that you will see. In fact it looks to be more non-tropical than tropical now. It is rapidly trasforming into a north Atlantic gale center. I am estimating a lower wind speed than the hurricane center. The speed on motion is translating into winds of 45 mph itself. 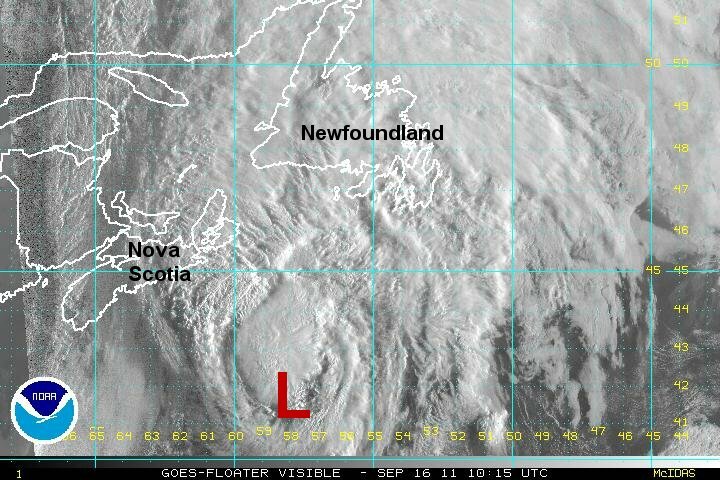 At 7 am edt / ast Maria was centered at 42.5 N / 58.0 W or about 400 miles sw of Cape Race, Newfoundland. Top sustained winds estimated at 70 mph (NHC 80 mph last advisory). Movement: ne 45 mph. Pressure estimated at 979 mb. Maria will pass over or just south of the southeastern part of Newfoundland later today. Satellite pictures show that Maria is losing its tropical characteristics and doen't look much like a hurricane any longer. It is still moving rapidly northeast and will pass near the southern tip of Newfoundland around 4 pm this afternoon. 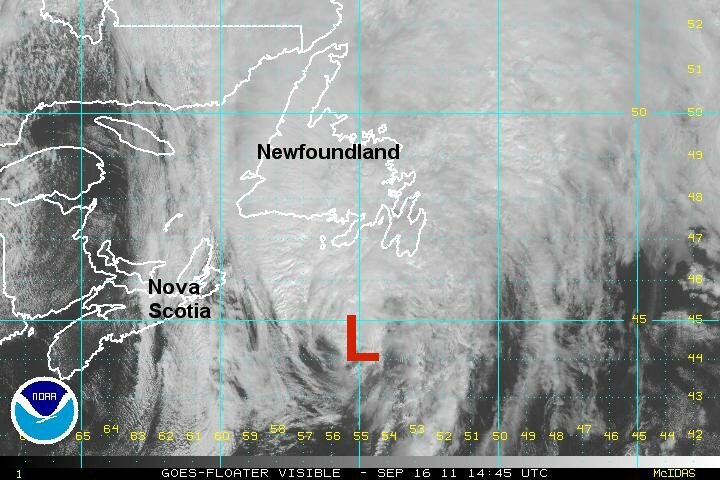 At 12 pm edt / ast Maria was centered at 44.8 N / 56.5 W or about 170 miles sw of Cape Race, Newfoundland. Top sustained winds estimated at 65 mph (NHC 75 mph last advisory). Movement: ne 40 mph. Pressure estimated at 983 mb. Maria will pass over or just south of Cape Race, Newfoundland this afternoon. This will be the last update on Maria.